Photovoltaics - Our partnership with the sun is stronger than ever. Once again ecomagination works in harmony with nature. With a wide range of solar solutions, customers are able to generate power from the sun with zero noise pollution or air emissions. From larger systems, like the one running Napas first 100% solar winery, to an increasing number of homebuilders incorporating solar into the communities they build is helping businesses and homeowners manage their energy costs while reducing their dependence on fossil fuels. 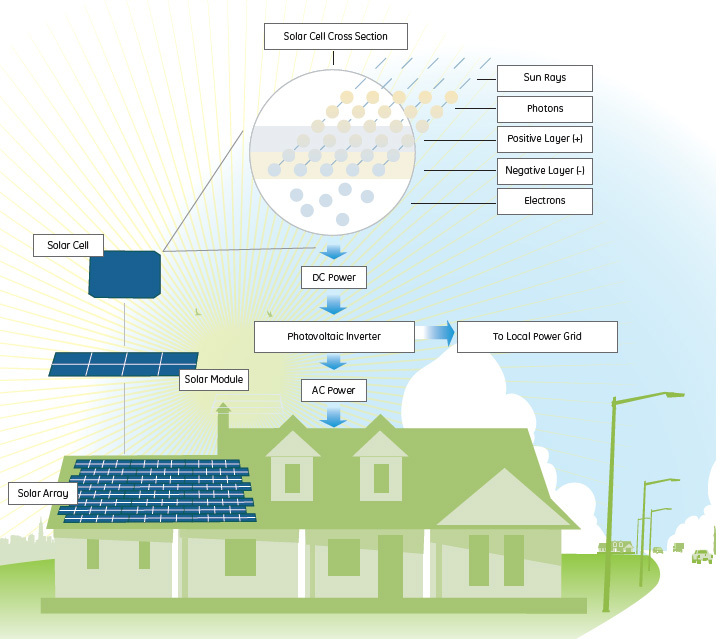 Using panels that blend seamlessly with the roofline, Roof Integrated Tile (RIT) systems are an energy generation technology that has no additional footprint and can help homeowners realize savings of up to 60 percent on their monthly energy costs. These installed photovoltaic systems globally generate enough electricity each year to power 12,000 homes, and will displace carbon dioxide emissions equal to the amount of carbon dioxide absorbed annually by more than 22,000 acres of forest. If the U.S. Department of Energys Million Solar Roofs Initiative were powered by photovoltaic modules such as GEs PV-165 modules, it would result in approximately 2 million fewer tons of carbon dioxide emissions, which is equivalent to driving more than 181,000 cars once around the world. If the Million Solar Roofs Initiative were powered by photovoltaic modules such as GEs PV-165 modules, it would result in approximately 15,000 fewer tons of sulfur dioxide emissions, and approximately 4,200 fewer tons of smog-forming nitrogen oxide emissions per year. If just 7 percent of the land area of Arizona were covered with GEs PV-165 photovoltaic modules, the amount of electricity that could be generated on a sunny day would equal the average daily electricity demand of the entire U.S.
where researchers are working to unlock the potential of nanoscience to battle global warming and disease. A nanotech boom in the Bay Area has begun, but what will it bring? From Lawrence Berkeley National Labs to Silicon Valley, researchers are manipulating particles at the atomic level, ushering in potential cures for cancer, clothes that don't stain and solar panels as thin as a sheet of paper. an explanation of the term nanotechnology. examples of nanotechnology studies being conducted in the Bay Area. Atoms are the basic building blocks that make up what is called matter. These building blocks are arranged in a variety of ways to create everything from bugs to balloons, cars to stars, aardvarks to orchids, atmosphere to oceansand, of course, you. Scientists have discovered 90 naturally occurring kinds of atoms and have been able to synthesize about 25 more in the lab. They have long been able to combine these atoms in ways that create new and interesting chemical reactions and materials like medicines or synthetic fabrics. 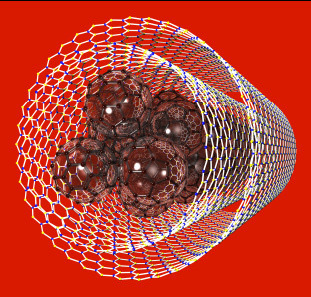 Recently, they have begun to manipulate atoms one at a time, or molecule by molecule, in a field called nanotechnology. Nanotechnology is the science of building materials and devices from single atoms and molecules. This emerging interdisciplinary science combines chemistry, engineering, biochemistry and materials science. Its bigon a really small scale. How small? Nano comes from the Greek word for dwarf, which gives you a clue. One nanometer is one billionth (1,000,000,000) of a meter. Compare that to a human hair, which is about 80,000 to 100,000 nanometers thick, or a twisting DNA molecule 4 nanometers thick. The smell of freshly baked pizza happens on the nanometer scale, too. The scent molecules of that pizzas aroma are less than a nanometer in diameter. Scientists have discovered that materials on an atomic and molecular scale behave very differently and have unique characteristics that differ from those of larger objects. In much the same way that magnets have positive and negative poles that are attracted to each other, the atoms and molecules of these nanoscale materials stick together because of charges that attract or shapes that fit together. The unique properties of these atoms let scientists create products like stain-resistant and wrinkle-free pants or sunscreen that blocks ultraviolet light. Dye sentisitized solar cells are photoelectrochemical cells that use photo-sensitization of wide-band-gap mesoporous oxide semiconductors. These cells were invented by Michael Graetzel et al.1) in 1988 and are also known as "Graetzel cells". These cells are extremely promising because they are made of low-cost materials and do not need elaborate apparatus to manufacture. The cells have a simple structure that consists of two electrodes and an iodide-containing electrolyte. One electrode is dye-absorbed highly porous nanocrystalline titanium dioxide (nc-TiO2) deposited on a transparent electrically conducting substrate. The other is a transparent electrically conducting substrate only. The cells have been compared to photosynthesis because they use the redox reaction of the electrolyte. The energy conversion efficiency of the cells has not yet reached the level of silicon solar cells. The current energy conversion efficiency is about 10%, as was reported by Graetzel et al. It is thought that the energy efficiency can rise beyond the Shockley-Queisser limit of 32%. How does a dye sensitized solar cell work? 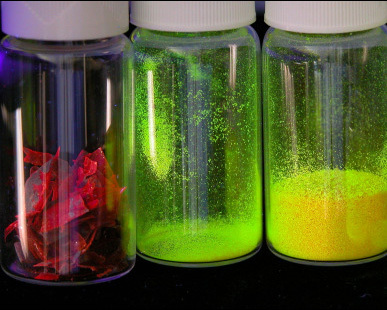 This advanced DYE SENSITIZED THIN FILM works on a very different principle than traditional polycrystalline where the absorption of light and the separation of charge carriers do not take place in the same material. The cell consists of two conducting electrodes (usually in the shape of small plates) in a sandwich configuration with a redox electrolyte separating the two. On one of the electrodes a compact, but very porous layer of TiO2 is constructed. On the particles of TiO2 a dye is absorbed. When light falls onto the dye sensitized solar cell it is absorbed by the dye. The electrons that are excited, due to the extra energy the light provides, can escape from the dye and into the TiO2 and diffuse through the TiO2 to the electrode. They are eventually returned to the dye through the electrolyte. The dye sensitized cell is made from lower cost materials than the conventional type with silicon wafers. TiO2 is a very common material (also used in toothpaste and sun lotion) and the dye can be an organic type like the colouring you find in blackberries. What is its similarity to photosynthesis? It has to do with the absorption of light. Light generates electrons and positive carriers and they have to be transported. In a semiconductor silicon cell, silicon material absorbs light, but it also conducts the negative and positive charge carriers. An electric field has to be there to separate those charges. All of this has to be done by one material. Silicon has to perform at least three functions. To do that, you need very pure materials, and that brings the price up. On the other hand, the dye cell uses a molecule to absorb light. It's like chlorophyll in photosynthesis, a molecule that absorbs light. But the chlorophyll's not involved in charge transport. It just absorbs light and generates a charge, and then those charges are conducted by some well-established mechanisms. That's exactly what our system does. The real breakthrough came with the nanoscopic particles. You have hundreds of particles stacked on top of each other in our light harvesting system. Our 30MW production equipment is coming on line within the 4th quarter of 2007 with product availability shortly thereafter. 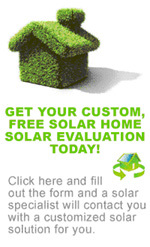 What is the main advantage of your advanced solar cell technology? This technology has reduced capital manufacturing costs, a lower energy footprint, environmentally friendly raw materials and the ability to produce electricity in low light, outdoor conditions and indoor lighting. Nanotechnology is the science of matter at the scale of one-billionth of a meter or 1/75,000]th the size of a human hair. Currently it has been receiving vast amounts of research funding from government and industry alike. In addition to numberous advantages provided by this scale of miniaturization, quantum physics effects at this size range pride additional novel properties. By manipulating atoms at this building-block level, scientists can create stronger, lighter materials with tailored properties. Combining research from many disciplines, near-feature nanotechnology applications involve everything from scratch-proof glass to internal drug delivery systems to a sugar cube-sized computer capable of storing the information from the entire United States Library of Congress.